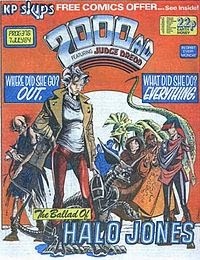 I would love to know the results of a survey of those who read the comic 2000AD in the late 70's/early 80's as to 1. how political they became and 2. what their political allegiances are. I would nearly bet most of those who were, like me, exposed to writers such as Alan Moore; Alan Hebden; John Wagner and Alan Grant and amazing artists such as Ian Gibson, Carlos Ezquerra. Massimo Belardinelli and Mike McMahon veer to the political libertarian left. Very few of their comic strips, at least the ones I remember, are not critiques of racism, sexism, consumerism and indeed, Capitalism itself. Drawing on their experiences in 70's and eighties Britain, the characters I remember from my early teenaged years struggle to escape or fight to entrench as "antiheroes," dystopian versions of our late capitalist- imperialist world. Characters such as “Meltdown Man” fighting against an apartheid world, “Judge Dredd” fighting to enforce a neo-liberalist, segregated capitalism; “Flesh” - exploiting new technologies to feed markets that threaten our past as present markets have wrecked our futures and “Invasion! A violent imagining of Britain invaded by a Stalinist state; “The Ballad of Halo Jones,” showing Halo’s attempts to escape; showing other’s caught up in the grinding turning of the wheel (“the hoop”); showing the profiting elite escaping on the “Clara Pandy,” the escape and luxury the poor can only aspire to enjoy. I used to spend hours on each comic. Engorging my imagination, speeding through the stories every Friday and then taking my time to study each amazingly drawn plate that night in bed. I used to painstakingly draw each admired character myself- Dredd, Jim diGriz (the only drawing I still have is one I recently rediscovered of Angelina, The Stainless Steel Rat's girlfriend and a first love of mine...), Sam Slade, Nemesis, Hoagy, Bill Savage, the Harlem Heroes and Mach 1. Pouring over these worlds. Reading, imbibing, engorging my mind, escaping. Halo Jones escaped. She escaped the drudgery of unemployment in a working class scheme. She escaped the benefits trap. An intelligent, working class woman, wanting more than shopping malls in which she had to be extremely frugal, and full of competing, vicious poverty, she saw through the consumerism of escape in what they sold us; what they give us; what they need us to be. She escaped and, finding the utopia of work, that endgame that will make your world better, slaved for the rich on one of their intergalactic space-ships. The promise of seeing the universe showed her the inside of a cruiser for the rich. But one in which she managed to realise that the world she had been forced to live in was one of artifice created by others to keep her from being too much trouble to them. My mum switches on the record player at the wall. “Where the mountains meet the sea, And lights spit stains on the scenery…” The dystopia in my mind merges with the words… “And it’s breaking through…” The speakers on either side of my bed boom out Toyah’s “Thunder in the Mountains. I give my early teenaged self until the end of the song to get up… I take a towel and stumble downstairs to the bathroom, shower and pull on my High School uniform and school bag and walk fast up the hill, getting there just after the bell. Routine. A small cog. Ready to turn the wheels that churn out their perma-freedom. I collected every issue of 2000AD from issue one through to issues into the 400’s – some of the gaps filled by my friend Alex passing them on… and although a few years after I had stopped buying them, I remember my shock on finding out my dad had thrown them out. 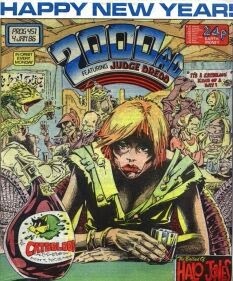 My decision to stop buying 2000AD was made not because I had lost interest- but because of perceived peer pressure. At the age of 15, my friends and I were in the throes of casting off all of the aspects of us that were not considered “manly; working class.” We were changing how we looked, spoke, socialised and how we treated each other. Being 15 is a constant battle not to say or do the wrong thing - one slip and you leave yourself open to social exclusion at worst, severe "mobbing,” as it would be known now in this futureshock world, at the very least. I gave up comics. Cheeky Weekly, Plug, Warlord, Battle and the amazing 2000AD were replaced by drink, "love" affairs, music and clothes. All fleeting (except for music) and all part of growing up. The clock radio comes on; “The horse with No Name.” Every morning it is the same music, played on a loop from an unmanned illegal radio station broadcasting from just over the Irish border, outside Dundalk. I slowly emerge from whatever utopia or dystopia my mind has created during my final REM sleep. 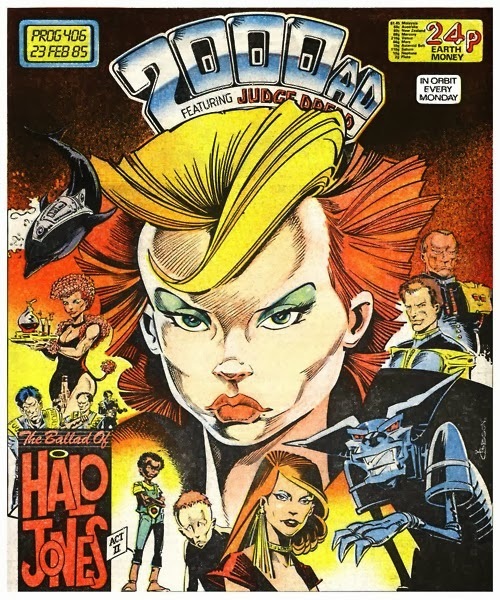 Halo Jones escaped to another world, where she was unemployed again, where she escaped into alcohol, drudgery, poverty; and then escaped again as an economic conscript in a rich man’s war for markets. I drag my early twenties carcass out of my bed and stumble downstairs to the bathroom, shower, grab some toast, iron a shirt, dress and almost run out of the front door into my green Fiat Strada. I hit 60, belting up the road to the factory, through the gates and run in to clock in just in time. Routine. I long for the weekend, the escape, the pub crawl, the craic, the music, hoping to find escape in a glass or a girlfriend or some mad, drink induced confidence that drives an adventure. My late teenaged life had the hope of holidays, night-clubs, pubs, music, Ibiza. Escape. Music, drink, drugs, food, buying stuff, sport, reading, big speakers booming Echo and the Bunnymen, New Order, The Waterboys… all of the time, wanting. Wanting escape, and the next thing they sell me will bring me nearer to that escape. A new love; a holiday; a jacket a shirt a pair of boots; a weekend drinking session; an expensive ticket and a couple of hours watching a band… Escape. I escaped to university in my mid-twenties to find new routine, new drudgeries… the ivory tower of escape only created in me a new marketing target for them. The latest, fashionable wine, crisps and bath salts; aged whisky/whiskey; expensive chocolates. An ever decreasing circle of consumerism and a realisation there is no escape unless you are so rich you can change your routines whenever and however you want. A different cog. My phone shrieks shrilly and I fumble to get it to stop. I don’t think I reached my final REM… I have no memory of utopia or dystopia. I stumble into the bathroom, shower my middle aged body, walk the dog, have my fruit, porridge and coffee and drive/cycle or take the train to work. I get there just in time… Routine. An older cog. My escape, my route out, a cog in the machine that will hopefully change this world through words, through creativity, through politics. My son’s world of routine – the drudgery he wants to escape from - the hierarchy of adults, parents, routine... his escape, education, gadgets, parties, science on YouTube and computer games that render those worlds - though without the social commentary and all of their computer games just excuses to kill "the other." Few of the shoot'em ups he plays go beyond the, granted more primitive world, of the Space Invaders/Defender/Firebird of my day. But they do take up time. The time I spend on studying the imaginations of Moore, Hebden, Gibson and Belardinelli. The time I spent on making my own worlds on the page, both lined and blank with pencil, pen, adjective and colouring pencil. None of the games conclude so beautifully and satisfactorily as a graphic novel. And escape is still commercial. Still enriching the corporate few who can escape whenever they want. “It feels like a web, straining against me, growing taut, finally snapping strand by strand, and then I’m out. Just out.” Say’s Halo Jones at the end of the unfinished Ballad. Hurry up Moore and Gibson and let us know if she really escapes her drudgery, her poverty, her alcoholism, her need to escape. You speak for the majority ..
Have you heard the halo jones song by Terence chua . Easy to find it online. One of the most poignant songs ive heard. Check it out. A new Dr Who... a new Scotland?